Coup packs a dense social experience into a tiny box. Within that it manages to create a rich context for backstabbing and political maneuvering from fifteen cards and a pile of cardboard coins. We liked it enough to give it three and a half stars in our review. It plays quickly enough not to overstay its welcome, and has real energy and electricity at its core. 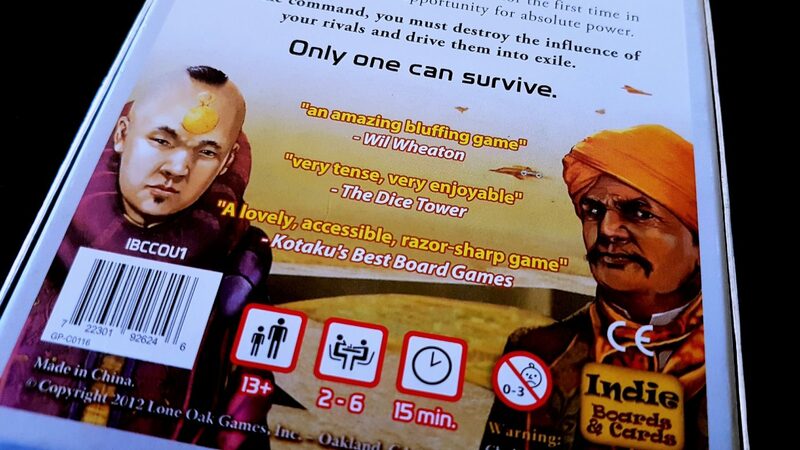 I’m happy, with some caveats, to recommend it as a game. Could I recommend it as an accessible experience? Let’s find out. I’m going to spend three coins to assassinate the hell out of every part of this game. 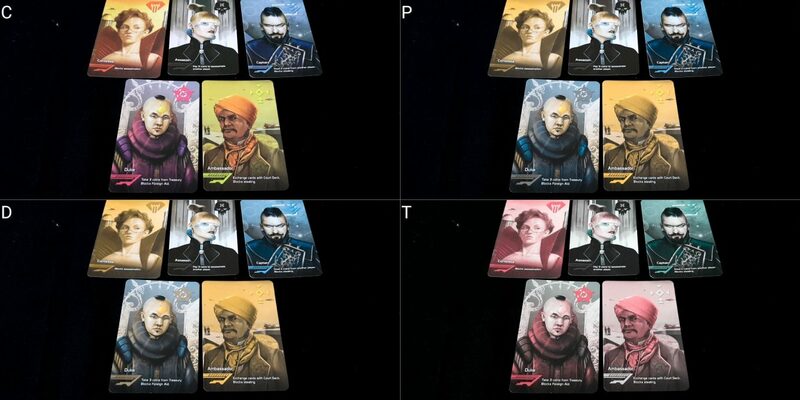 There’s such a limited set of moving parts (only five different role cards) and so few components (cards and coins) that colour blindness simply isn’t going to be an issue. We’ll give Coup a strong recommendation here. 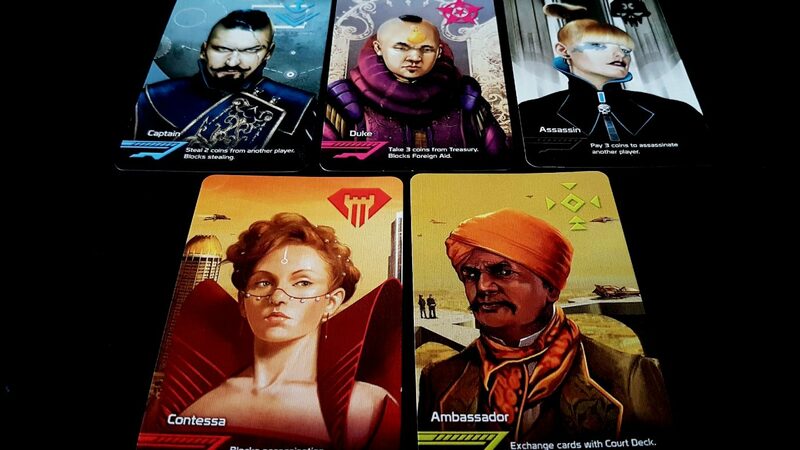 Each of the cards in Coup are large, well differentiated, and relatively easily visually parsed. Key information is located along the bottom, and while the text is not especially large in terms of font-size it’s well contrasted and to the point. This in itself is likely to be an issue only for the first game, because the rules and counteractions are reasonably easy to memorise and before too long the descriptions on the cards won’t be necessary. More than this though, the only thing a visually impaired player needs to know is what cards they have and what cards have been revealed. There are only five different kinds of cards, and three of each. The discard pile may not be especially easy for players with visual impairments to make out, but layering them out grouped by role would help with this. In any case, no game information is leaked by asking how many of each card are still in play. That is, other than such an inquiry might alert other players to the odds in a way they may not have considered for themselves. 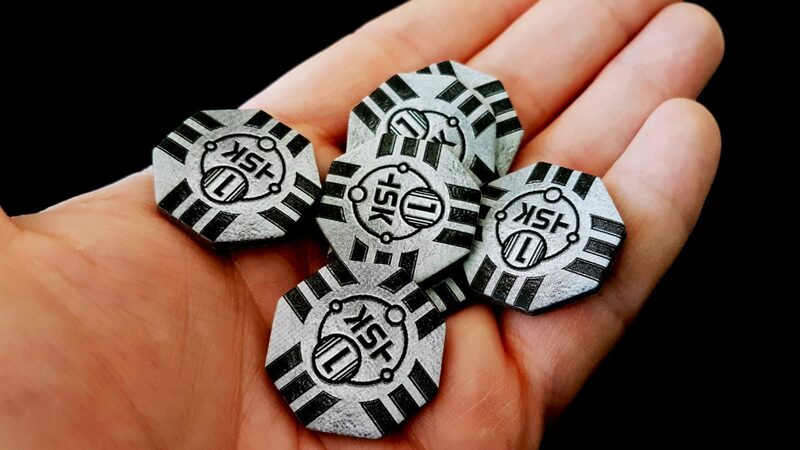 The coins in the game are pleasingly tactile, and they come in only a single denomination. It is the number of these, rather than the specific face value, that is used to determine costs of actions. Players will easily be able to count their wealth by feel, although there is a small danger that being too conspicuous in this might reveal some intention. You will only ever have a maximum of ten coins though, so it’s not infeasible to simply remember the total or to adopt a money count into the regular course of a turn. In cases of total blindness, the cards don’t offer any tactile identifiers that would permit someone to make out the roles they have been assigned. 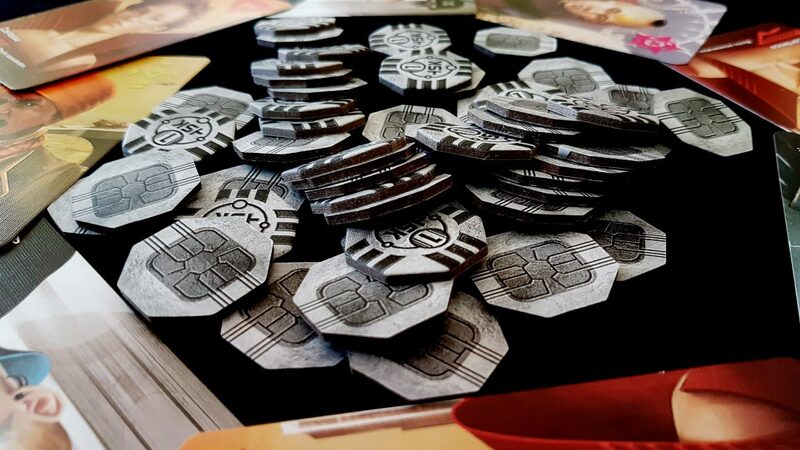 Given the small number of components the game does yield itself easily to modifications such as small notches in the cards or the application of tactile identifiers. We’ll strongly recommend Coup in this category. The core hook of Coup is assessing probability and intention within a rapidly diminishing problem space. In that respect it asks certain things of players, specifically the ability to intuit risk and reward within a degree of uncertainty. Someone saying they have a Duke when two have been discarded is a different thing from saying it when none have been revealed. Similarly, if two people claim to have a Contessa when you have two in your hand it shows that at least one of them is lying. Some actions too will vary in desirability as the probability of cards is adjusted. If you claim foreign aid (two coins) you might be blocked but the risk of that is linked to the chance someone has a Duke. There are some elements of explicit numeracy too, including tax, income, assassinations and coups. These aren’t onerous, and are limited to counting and comparison. Visual aids could be provided to compensate for this if needed. The rules aren’t especially taxing by themselves, but they fit into a game flow that requires a degree of negotiation and employs an element of flux. Challenges in some scenarios are batted back and forth with the consequences and cost of failure varying with each bluff and counterbluff. For example, if someone takes foreign aid and someone says ‘No, I’m a Duke’ it’s simple – you can challenge or not. That’s easy. However, if someone says ‘I want to use my assassin on you’ it becomes a multistage process. I can accept or not, which puts the decision on me. I can challenge that you have an assassin, which puts a new risk on me. I can tell you I have a Contessa, which puts the decision of acceptance on you. You can challenge that, which puts the risk on you. The ownership of the risk varies as actions are undertaken, and the cost of a challenge may be small or large. Declaring you have a Contessa in response to an Assassin could instantly remove you from that round of the game if you’re challenged and found to be bluffing. Challenges may, or may not be issued and they may be issued from people not involved in the action. The game flow then is highly malleable. Rules don’t particularly require and understanding of synergy but some cards work together especially smoothly – the Assassin and the Duke for example allows a player to gain money rapidly and then spend it on a kill. Or the Contessa and the Captain, which allows a player to prod the rest of the table with theft and then incentivise them to launch an assassination of their own. There are sufficiently few roles in the game that this need not be assessed for every new combination in a hand, but good play can be as much about provoking a response as it is about taking an action. For memory, we don’t have any real problems – the discard pile is common knowledge and can be arranged in such a way to reveal the number of discards of each role. Deck composition is not a major feature of play, since every role has three instances throughout the deck. No cards are burned or secretly removed from play. Every game begins with the same starting ingredients. We’ll give Coup a tentative recommendation in the fluid intelligence category, and a recommendation in the memory category. The flow of play is highly variable, but the relatively small set of possible interactions of cards constrains the complexity by a considerable degree. Coup is built upon player elimination but rounds are short and nobody need be out of the fun for long. There can be as much enjoyment that comes from a brazenly courageous failure as from a success. Importantly too is that element of the meta-game – it’s possible to tactically lose games in order to influence as best you can the games that will follow. However, you can’t get around the fact that everyone around the table is trying to knock you out of play. That by itself can be a deal-breaker in this category even if it’s handled in a positive way. As Coup is a game of negotiation and bluffing, it’s important that players feel comfortable with lying and picking up on lies. The only thing that determines whether you can perform an action or counteraction is the collective judgement of the table. That’s not going to go your way if you have obvious tells or find it difficult to convince others that you have cards you don’t. If you always play honestly in Coup, you’re going to suffer – as is everyone else. If the perpetually honest player says ‘I have a Contessa’ when two have already been discarded, everyone at the table just lost the bluff they might have made themselves. The counteraction system too introduces a form of ‘take that’ in that you can be stopped from doing any interesting action by someone just saying ‘No, you can’t do that’. There is a risk associated with challenging a counteraction too and you might find simply trying to take your turn knocks you out of the game. As I mentioned above, I think the player elimination model is Coup is overall handled in a healthy way but it doesn’t change the fact that this kind of mechanic can be very frustrating. That’s especially true when there is an inevitability about certain interactions. For example, if you send an assassin after someone with a single card there is no cost to them claiming Contessa. If they have one, they are saved. If they don’t have one but you accept the bluff, they’re saved. If they don’t have one they’re assassinated but that would happen anyway. As such, you might find yourself caught out by this scenario through no fault of your own. There aren’t many of these kinds of stumbles in the rules though. Coup absolutely permits, and perhaps even encourages, a degree of ganging up on players if they reveal weaknesses. Someone with a single card is an easy target for everyone around the table, and while you can claim that you can counter anything that’s thrown at you only one of those claims at most will actually be true. If you’re not able to convincingly claim a card you don’t have, not only are you an easy target but you’re going to reveal a lot of what’s still floating around the table as a result. Tied into all of this is that not everyone gets to enjoy a game of Coup to the same extent. You might be locked down every turn into not being able to do anything. You try to steal, and you’re blocked. You try to assassinate, and you’re blocked. You try to take foreign aid, and you’re blocked. You claim a tax, and you’re challenged, and so on. The result of your turn might simply be for you to lose a card, and then to be the focus of everyone else’s attention for the rest of the round until you’re knocked out of play. Really, what all of this comes down to is that there are many things you’ll need to take into account before bringing Coup out for a group where emotional issues may be a factor. If people are focused on individual rounds, all of these elements will likely be a problem. If people are focused on the larger meta-game of aggregated rounds, they’ll be less of an issue. We’ll recommend Coup in this category, but as usual you’re the one that will know if this discussion suggests its applicability for your own group context. With the use of a standard card holder, Coup offers few accessibility challenges here. Really, you don’t even need to hold the cards – you can place them face down in front of you and just remember what they are. You only have two at a time (at most) and each will be one of five possibilities. Everything else in Coup is a matter of negotiation, bluff and counterbluff. The coins you get are pleasingly tactile and easy to manipulate too, although there’s no reason you couldn’t track these with some other method if desired. If physical interaction is likely to be an issue, the game is fully possible to play with verbal cues. Discards can be as simple as ‘discard my first card’ and actions can all be unambiguously described. We strongly recommend Coup in this category. A minor degree of literacy is required to learn the rules, but it’s easily handled with a small crib sheet. There aren’t a lot of moving parts here to learn. That at least should not be a major issue. What’s more likely to be a problem is the need to bluff and counterbluff, although this need not have the same kind of complex information content of something like One Night Ultimate Werewolf. You can play a fully enjoyable game of Coup with very terse communication. ‘Foreign aid’. ‘Blocked’. That would convey a large portion of the game state even if the more interesting forms of challenge such as interrogation and convincing would be difficult. 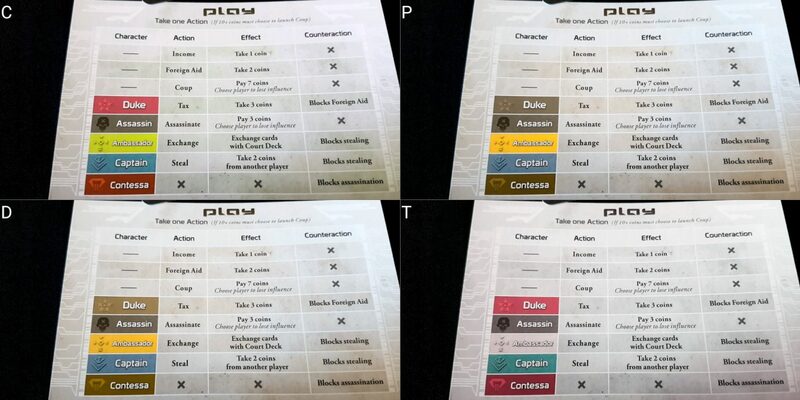 Realistically, you could play the entire game of Coup with gestures and a reference chart. Hold up one finger for income. Hit the table for a block. You could easily put together a physical or symbolic vocabulary that would permit the game to work for almost any group context. Writing on a whiteboard would be another perfectly feasible possibility if you don’t mind the game slowing down a little. We’ll recommend Coup in this category, although bear in mind that recommendation will vary depending on what level of negotiation and discussion you want to encourage between participants. There’s an awful lot to like here. 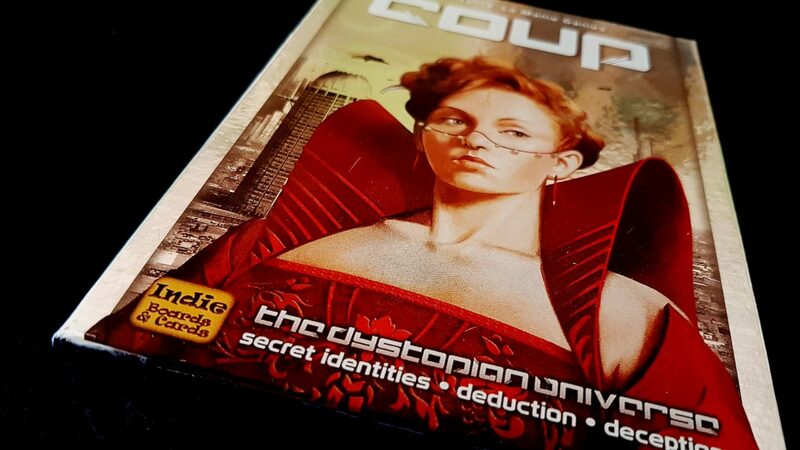 The cover of Coup shows the Contessa in a position of prominence, with two male characters on the back of the box to balance it out. While on a strictly numerical basis, it’s a 2-1 split it’s actually I think a fair distribution. The male characters on the back are more numerous, but less visible. The manual adopts a gender neutral tone, and is inclusive in the exemplar text it uses to explain how the game works. Great stuff there, really. This continues through to the courtiers themselves – two women, three men, and a good blend of ethnicities that show corruption in the future is a world-wide phenomenon. It’s a good example of leveraging the diversity of globalisation to make a setting richer and more convincing. In the world of Coup, the royal class is made up of plutocrats that exert influence by virtue of wealth rather than birth. Obscene wealth transcends ethnicity and nationality – Coup would have been less artistically interesting had the future been controlled solely by white male billionaires. The board of directors for Business Inc. Coupled to this is a pleasing price-tag – you can pick this up for about £13, and it supports player counts from two to six. Admittedly at two and three it’s not a very good game, but at higher counts it gives a considerable return on your investment. It’s short enough too to fit into a busy day without needing anything other than the right people around you. The round system as well means that it can expand to fill as much time as you can stand. If players involved in Coup manifest an intersection of cognitive and emotional impairment, we’d recommend you look elsewhere for entertainment. The nature of the game means that the result of actions can be difficult to predict, and the flow of responsibility from challenges means emotional impairment exacerbates some of the cognitive impairments and vice versa. We tentatively recommend the game in both of these categories, but we’d be more negatively inclined if dealing with combinatory factors. If dealing with a combination of physical and communicative issues, we’re pretty sure you could come up with some regime that would work – we discussed that a little in the communication section. The game yields itself very well to workarounds in this space provided you don’t mind potentially limiting the complexity of the discussions that might arise. Coup is a game of intense competition, but that competition is handled completely transparently and with few opportunities for players to undermine their opponents through leveraging inaccessibility. Actions need to be verbalised or indicated through some other system that makes them unambiguous – similarly for challenges and counteractions. That puts all the key information from play out there for everyone, without any of it being possible to hide. As such, while we often fret a little about competition in this section of the teardowns here it’s handled about as well as might be hoped. Coup doesn’t really support gracefully dropping out of play – the cards you hold have too powerful an influence on the game even if you’re not wielding them. You could shuffle them back into the deck, but that in turn would have an impact. This need not be a huge issue though – individual rounds of Coup are over very quickly and there’s usually no real cost in stopping mid-round to reset for a smaller player count. Well, look at that – Coup blocked my assassination with its Contessa. I challenged, but lost. I’m out of the game. And for some reason, out of my trousers. I didn’t realise this was Strip Coup. This has gone terribly for everyone involved. I’m so sorry. Trust me, this isn’t what any of us would want. Aside from some cognitive complexity, and some concerns regarding its suitability where emotional control may be an issue, Coup does very well in this teardown. We’d be inclined to say that the quick play-time and rapid evolution of the meta-game mitigates against many of the worries we’d tend to have of a game that involves such regular and unabashed player elimination. However, that’s going to depend hugely on individual and group factors. With a three and a half star review, and a good showing in this teardown, Coup is a reasonably safe bet for many players. Combined with its attractive price-tag, we think it deserves a spot in almost any game collection. You’ve got very little to lose if you fancy giving it a chance. 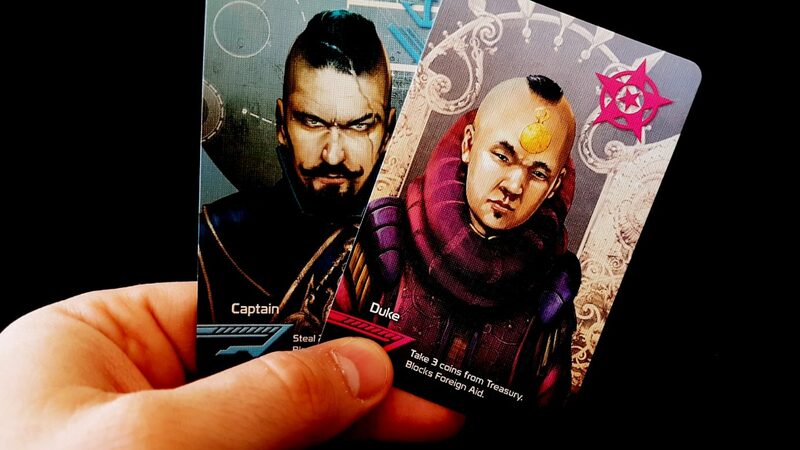 Now excuse me, I’m going to steal two megabucks from your pocket because I’m a Captain. Wait, where did your trousers go? WHAT IS HAPPENING HERE? ?